Even in our seemingly so rational and technological world, myths and legends have their place. Although most people no longer believe in evil wizards and good fairies, they do believe in the spider of the yucca palm or parallel civilizations hidden in the sewers. Our modern fairy tales are called Urban Legends. And they actually happened to a friend of a friend. In 1812, Wilhelm and Jacob Grimm published the first edition of their Children’s and Household Tales. They failed in their intention of gathering “purely German fairy tales”, for fairy tales know no borders. They draw on motifs recurring in various countries; their main characters are anonymous and stereotypical; they communicate traditional values such as loyalty, honesty and hard work, and focus these into a moral. The same is true of urban legends. So far the best researched legend is “The Vanished Hitchhiker”. It comes in countless versions all over the world: an elderly lady, who has purportedly missed her bus, is given a ride by a helpful young woman. The latter becomes suspicious when she notices the unusually hairy arms of her passenger. When she sees a police patrolman, she immediately stops and jumps out of the car. Together with the policeman, she returns to the car, but the stranger is gone. In the rush, she has left a plastic bag under the passenger seat. It contains an axe. The purported hitchhiker was apparently a wanted ripper, who dismembers his victims with an axe. People who pass on such stories usually guarantee their truth by affirming that they actually happened to a friend of a friend. This assurance is the “Once upon a time...” of urban legends, which is why they are also called “FOAF tales” (friend of a friend’s tales). Their moral is usually a more or less a direct warning against strangers (for example, the hitchhiker), exotic creatures (for example, the poisonous spider in the yucca palm) or the dark side of technological innovation: for example, for several years now in South Korea it has been rumored that people who turn up their MP3 player too loudly are in danger of being kidnapped. Bielefeld doesn’t exist! A massive disinformation campaign, however, has been launched to convince mankind of the existence of a large city of this name located in eastern Westphalia. The legend of the so-called “Bielefeld Conspiracy” has enjoyed great popularity since 1994 (except among Bielefeld residents). In the internet, whose social networks contribute considerably to the spread of urban legends, the story has the status of a piece of modern folklore. Gags such as the trucker who sets off for Bielefeld but never arrives are simply too good to be true. In our culture based on writing, urban legends are a bastion of oral tradition. Whether we believe (or want to believe) them or not, we like to pass them on. Not by candle light round the family hearth, but in a dimly lit bar. 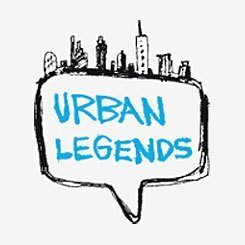 “Urban Legends” is a joint project of the Goethe-Instituts of Belgium, Brazil, France, Greece, Israel, Italy, Japan, Cameroon, Canada, Korea, Poland, Russia, Senegal, Spain, the Czech Republic, Hungary and the Internet Department of the Goethe-Institut Headquarters in Munich.